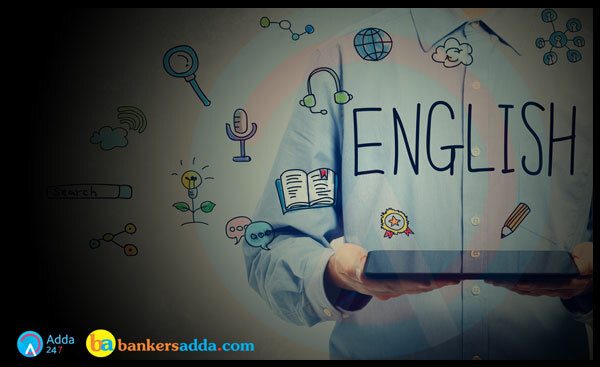 English Language Section has given heebie-jeebies to the aspirants when they appear for a banking examination. As the level of every other section is only getting complex and convoluted, there is no doubt that this section, too, makes your blood run cold. The questions asked in this section are confusing and very time-consuming. But once dealt with proper strategy, speed, and accuracy, this section can get you the maximum marks in the examination. 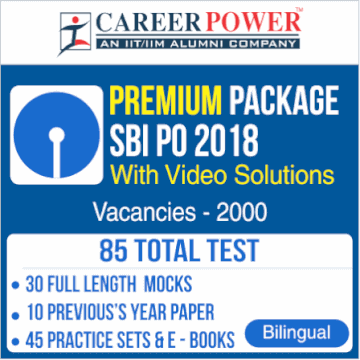 Following is the study plan for SBI PO Preliminary Examination 2018, the first week starts with practice questions on Reading Comprehension. To ensure proper preparation of the section we advise you to go through all the questions sincerely and try to attempt each one of them. Afterward, match your solutions and the approach with the one that would be provided later. Practice more and more questions on the same section to enhance your grip over the topics. Following is the English Language quiz to help you practice with the best of latest pattern questions. About 1,000 young men and women got the nod a few days ago from the Union Public Service Commission (UPSC) for induction into the Indian Administrative Service, Indian Police Service, and other services. This was at the end of a tough three-stage selection process, in which more than 4,50,000 candidates appeared at the first stage, a written test called the Prelims. Only about 13,000 made it to the written main examination, and 2,500 to the final interview stage. We should be grateful that we have such a rigorous process to choose those who’ll occupy vital positions in the higher echelons of the bureaucracy. Some five decades ago, when I took the examination, only about 10,000 competed for a little less than 1,000 openings. Interestingly, a candidate can now take the examination in his or her native language. Surprisingly, this facility is availed of only by a few. This will not change as long as our university education remains English-oriented. Despite all this flexibility, the current examination is extremely tough to crack, and it holds many surprises to a candidate who appears for the first time. It’s gratifying that the entire selection process has till now not been hit by any scandal, something very few other prestigious systems of recruitment in the country can claim. Also, the UPSC has had an enviable record of relative freedom from graft and politics, against the sordid image of most of the Public Service Commissions in the States, where jobs have often been sold. We can certainly have a more representative bureaucracy. Given the skewed selection decades ago, when the urban elite and middle classes managed to hog the services, we have come a long way to recognize and respect the diversity that is Bharat. This year, many of those selected were from rural areas; 120-odd were from the minority communities. Who can take exception or be blind to this inclusive nature of selection? We would like to see more from these groups. Any attempt to prescribe quotas among these groups will, however, be undesirable, apart from being unconstitutional. Of the successful candidates, 240 were women. We need to have a greater number of women. All this does not mean that we have a faultless system that offers no scope for improvement. A widely prevalent criticism is the pushing up of the age limit and the number of times a candidate may take the examination. Recent years have seen older candidates succeed. This has certainly had a negative impact on the utility of training. I don’t want to undermine the talent or sheer perseverance of those who get appointed in their thirties. What is disconcerting is the baggage that these recruits bring and the possibility that they may not be receptive to new inputs offered by a modern training programme. Is there, therefore, not a case for lateral entry through another set of examinations, whereby older individuals with past job experience can still get into the civil services at appropriate levels? There are two issues which are worrying. There is a certain lack of sensitivity to the needs of the common man, even among recruits from the lower economic stratum and those who have a rural upbringing. You will comprehend this harsh reality if you go to the grassroots of village administration, including the police. It is precisely to extirpate this phenomenon of bias against the rural poor that we welcomed the changing profile of the civil service. If the rural inductees to the IAS and IPS do not empathize with the villager, who will? Public servant corruption is still a harsh reality in urban and rural settings. While the intensity of this evil has come down appreciably in the Central government, the picture remains largely unchanged in the States. A 33-year-old IPS trainee in Maharashtra was recently caught demanding a 3-lakh bribe through an agent. An even more strident complaint against young recruits is their lack of preparedness to cope with political interference in day-to-day administration. Here again the fault is more with our vague training inputs and the leadership. Until we have an honest and fearless civil service we will not have fulfilled the dream of Sardar Patel, to whom a strong bureaucracy was the sine qua non of democracy. Q1. According to the passage, what is the facility provided by the civil services examination? (a) Special advantage to be given to students above 30 years of age. (b) There is no age limit for the examination. (c) A candidate has to take the exam in English language only. (d) A candidate can take the exam in his or her native language. S1. Ans. (d) Sol. Refer 1st para 8th line. Q2. What do the phrase “sine qua non” mean? (a) an essential and necessary condition. (b) a rule to be followed. (c) after effects or consequences of something. (d) a thing least required or least necessary. S2. Ans. (a) Sol. Sine qua non: an essential condition; a thing that is absolutely necessary. Q3. As per the passage, the complaint against young recruits is…. (a) not clearing the exams with good marks. (b) not having the complete knowledge about the administration. (c) not being able to cope up with political interference in day to day administration. (d) getting the job through biased selections. S3. Ans. (c) Sol. Refer 4th para 4th line. Q4. Which of the following given statements is not correct in context with the passage? (a) Only about 13,000 made it to the written main examination, and 2,500 to the final interview stage. (b) This year, many of those selected were from rural areas; 120-odd were from the minority communities. (c) Of the successful candidates, 240 were women. (d) More than 4,50,000 candidates appeared at the first stage, a written test called the Prelims and Only about 10,000 made it to the written main examination. S4. Ans. (d) Sol. Refer 1st para 4th line. Q5. Which of the following is the most appropriate title for the passage? Q6. Which of the following are the most prevalent criticism regarding civil services exam? (I) increasing the age limit for appearing in the exams. (II) increasing the number of attempts for a candidate to appear in the examination. (III) giving preference to older individuals with past experience. S7. Ans. (b) Sol. Gratify: give (someone) pleasure or satisfaction. S8. Ans. (d) Sol. Enviable: arousing or likely to arouse envy. Desirable: wished for as being an attractive, useful, or necessary course of action. S9. Ans. (b) Sol. Extirpate: eradicate or destroy completely. Revive: restore to life or consciousness. S10. Ans. (d) Sol. Strident: presenting a point of view, especially a controversial one, in an excessively forceful way. Subdued: (of a person or their manner) quiet and rather reflective or depressed. Directions (11- 15): Read the following passage carefully and answer the questions given below them. Certain words/phrases have been printed in bold to help you locate them while answering some of the questions. An outsider to India or millions of customers of over two dozen commercial banks in the country may be forgiven if they are left wondering whether India’s banking system is broke. Hardly a fortnight goes by without the CBI, the country’s federal anti-corruption agency, making public action against officials of state-run banks, against the background of reports of rising bad loans and governance issues at many banks, including storied private entities. Last week, the CBI said it has filed a case against 15 former officials of IDBI Bank including a former CMD of the bank, another former chief who is now CEO at another state-owned bank, and a former senior official, also a bank chief, besides three independent directors, for allegedly defrauding the bank of Rs 600 crore with regard to a loan disbursed to group companies of NRI businessman, Sivasankaran. 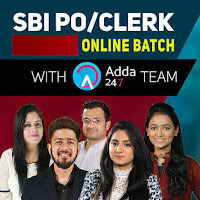 In its defence, IDBI Bank has said it had granted a loan to Axcel Sunshine, which became an NPA in December 2015 and that the loan has been fully provided for and that the lender had launched recovery proceedings. Over the past year and the last few months, several other bankers too have been named by the CBI. The agency seems happy to suggest that many senior bankers are involved in alleged malfeasance and provide a running commentary while questioning bankers, even before filing a charge sheet. This recalls an incident under the UPA government, when the CBI registered a preliminary enquiry against a former SEBI chairman and other regulatory officials only to retract it later. It is important that the agency goes about its task professionally to bring cases to fruition without giving the impression that it is on a fishing expedition. The agency ought to keep in mind the wider consequences of its actions to the country’s troubled banking industry and the knock to individual reputations. After all, banking is a business run largely on trust. Already, with almost a dozen banks under the Prompt Corrective Action framework, the ability of banks to lend is severely curtailed. Some are tempted to see a parallel in Chinese President Xi Jinping’s crackdown against corruption that helped him to consolidate power. But surely, the government, now in its final year, would be mindful of not wanting to leave behind a legacy of a banking system that is hobbled, and bankers who are fearful of lending, especially when economic recovery is underway. India’s banking sector should not be reduced to the same fate as the telecom sector, which was the country’s most competitive sector post liberalization. Q11. As per the passage, CBI makes public action against officials of state-run banks based on which grounds? S11. Ans. (d) Sol. Refer 1para 4th line. Q12. Which of the following is correct in context with the passage? (a) CBI is the country’s federal anti-corruption agency. (b) IDBI Bank has granted a loan to Axcel Sunshine, which became an NPA in December 2015. (c) Many banks are under the Prompt Corrective Action framework and the ability of banks to lend is severely curtailed. S12. Ans. (e) Sol. All sentences are correct. Q13. As per the passage, which was the country’s most competitive sector post liberalization? S13. Ans. (b) Sol. Refer last two lines of the passage. S14. Ans. (b) Sol. Hobbled: restrict the activity or development of. S15. Ans. (a) Sol. Fruition: the realization or fulfillment of a plan or project.